– Quick trips to the store, usually ends up buying 54% more than intended. – Checkout displays accounted for the most! The more often you go to the supermarket, the more often you’ll walk past displays, offers and advertising, and these will all add up to impulse buys, which are not in your budget. Consolidating your shopping list and cutting down the total number of trips to the store can save you money. The authors also make references to using coupons. However, the coupon culture is not as extensive in Singapore as it is in the US, so it might not be as relevant. The terms ‘Loss Leaders’ and ‘Cherry-picker’ are mentioned. Loss Leaders: These are products that grocery stores advertise to sell below their cost, to bait shoppers to shop at their store. They are counting on customers to pick up other full-price items while there. Cherry Picker: Annette advocates shopping at various grocery stores just to pick up their loss leader items. 1. If you want something, save for it. 2. Save for it every month. 3. Don’t rely on your credit card if you can’t pay for it. For example, if you plan to take a vacation in a year’s time, and you estimate it’ll cost $2,400, start saving $200/month for the vacation. If you have car tax and insurance due every year, break the amount down by 12, and set aside money for it. When it’s finally time to pay those huge bills, or have fun on your vacation, you know there’s money in the kitty, and that will give you peace of mind. It’s not easy keeping track of a budget. One way to do it is to use the ‘envelope system’. Basically, with your budget in hand, you would know how much you need to allocate in each category. 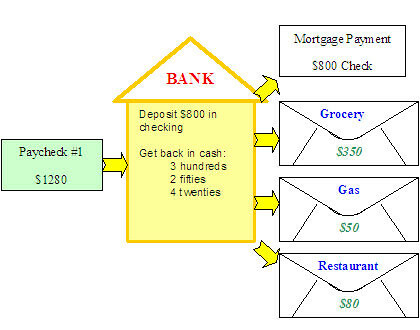 Physically make each category an envelope, and put the relevant cash in the envelope. Once the envelope is empty, it means you have used up your quota for the month, and you will have to either take money from another category (eg. recreation), and spend less on that category for that month, or wait till the next month. You have to keep track of where your money goes for any budget system to work. If this is something you have never done before, you have to start picking it up. If not, you’ll might end up spending more than you earn, or never being able to save for anything. Analyze your budget each month to see what is working and what is not. You may find out that some categories need more $$, while others could do with less. Fine tune it as you go along. This entry was posted on Thursday, October 16th, 2008 at 12:02 am and is filed under Book Reviews, Singapore Watch ver 2.0. You can follow any responses to this entry through the RSS 2.0 feed. You can leave a response, or trackback from your own site. Seems like common sense to me all this advice. I find it amazing some times that a lot of people seem to have lost this common sense. wouldn’t it be nice if we could get back to spending only the money what we have. The idea is very simple. Income less savings = expense. Save first then allocate what is left for your expenses. It’s very simple but the difficult part is the execution.